Burial Mist is a solo-project by a guy who calls himself Coffin Spirit (he recently joined Unholyath’s roster, as new bass player). The band is located in Novocherkassk, a city close to the Ukrainian border (not that far away from the Sea of Azov), formed in 2007. Throughout the years, there were several demos and EP’s, some compilations, two full lengths, and a couple of splits (with the likes of e.g. Solus, Sekhmet and Unholyath). 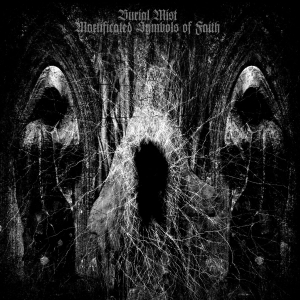 Mortificated Symbols Of Faith opens with a short yet sort of ‘beautiful’ intro, Unholy Ritual (Pt. II), a horrific-cinematic and deeply ominous symphony with dark ambient keyboards (several layers, the horror movie-alike kind), including malignant growls at the background, some sampling, and something that sounds like xylophone-like wind bells as from half of the composition. And as from You Dead Forever, Burial Mist shows its real, ugly, tormented and scarred face. The core of this album is based on mid-tempo (pay attention: there are quite some brutal outbursts too) oriented Occult Black Metal from the Old Skool. It is like a raw interpretation of the hiatus in between the First and the Second Wave, with a universal approach and a thrashing attitude (despite not being blasting fast in essence). In a sense, this stuff is groovy (yet not as in (grooving Groove, you know), quite melodic, and enormously pushing, pounding and hammering in its execution. There is quite a lot to discover, though the basics are primitive / primal at the one hand, and minimal in structure. The songs, being brute and rude, and very melodious and rhythmic, containing enough variation to stay interesting. The leads within each track are sort of ‘refreshing’ (not kidding), and they go perfectly hand in hand with the curvy song structures. Remarkable is this project’s cover song for the track Icons Of Torture, taken from Fire Burns In Our Hearts by Clandestine Blaze. It actually fits well to the whole. I think the sound created by Burial Mist is an excellent one to perform such fin original composition. The performance comes very close to the original one, yet with that typifying sonic identity of Burial Mist taking over the original mystery. Fine! A point of attention might be the sound quality. I dislike blackened material that is too clean, and my preference indeed goes out to an underground approach. But the mix is way too harsh and chaotic, to my (very influential, haha) opinion. I would have preferred that sound that gets used within the Nordic trend, for in this case it drenches the whole in a rather mechanical sonic mist. No, I won’t say that the aural aspect is bad – it is not bad, let’s be sure about that. But the lack of ‘mysticism’ of ‘hypnosis’ might be a pity. But I am just bitching for I just felt like doing so (once again: haha). It’s cool, this album is just cool!